This sprawling desert city of Rajasthan is an eye-catching site of traditional Rajasthani attractions, well-fed camels and citadels. The city was founded in 1488 by a descendant of the founder of Jodhpur named Rao Bhikaji. The city is surrounded by high fortifications comprising a seven-kilometre long wall which encircles the old city and has five entrances. All these were constructed in the 18th century. The exotic camel safaris, its gorgeous forts and the worship of thousands of holy rats at Mata Kali temple are some of the most interesting aspects of Bikaner. » Junagarh Fort - Built by Rai Singh between the period of 1588 and 1593, the fort has a 986-metre-long wall with 37 bastions, a moat and two entrances. It towers prominently over the city and can be seen from a distance. Its most unusual feature is that it was built at ground level and not on high ground. The fort and its palaces are profusely decorated with magnificent stone carvings. The major buildings within the fort include the Anup Mahal, Diwan-e-Khas, Hawa Mahal, Badal Mahal, Chandra Mahal, Phool Mahal, Rang Mahal, Dungar Mahal, and Ganga Mahal. » Lalgarh Palace - Built by Maharaja Ganga Singh in memory of his father, the Lalgarh Palace is a an architectural masterpiece in red sandstone. It is situated 3 kms north of Bikaner city. Designed by Sir Swinton Jacob, the palace has beautiful latticework and filigree work in sandstone. The palace is quite imposing with overhanging balconies and delicate latticework. Peacocks and blooming bougainvillea in the garden welcome the visitor to the palace. » Temples - The temple of Karni Devi is the most important one as it is dedicated to the family deity of the royal house of Bikaner. The Bhandeshwar and Sandeshwar Jain Temples are dedicated to the 23rd Jain Tirthankara, Parsavnathji. Built in the 16th century by two brothers whose names they bear, these temples are remarkable for their colourful murals and the prolific use of gold leaf and mirrors. » By Air - Jodhpur is the nearest airport. The airport is easily accessible by road. » By Rail - Bikaner has number of train links to connect it with the major cities of India. » By Road - It is well linked with the big and small cities of India by the national highways and other roadways. Jodhpur, the second largest city of Rajasthan is one of the most loved tourists destinations in India. It stands on sandstone hills and is surrounded by a strong wall of 10 kms. Rajput chief Rao Jodha founded Jodhpur in 1459. 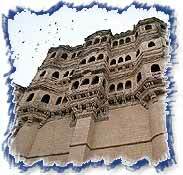 » Mehrangarh Fort - Built by Maharaja Man Singh, it is a fine example of military might of Rajputs. The fort is spread over 5 kms. » Umaid Bhawan - This architectural wonder is made of sandstone. Today, it has been converted into a museum and a hotel. 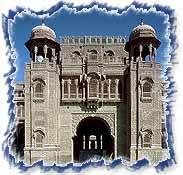 » Jaswant Thade - It was built in the memory of Maharaja Jaswant II. Many tourists flock to his shrine to pay their homage. » The Mahamandir Temple - Built in 1812, this striking temple is an excellent example of cutwork done on stone. » Giridkot and Sardar Market - These are famous markets of the city to buy ethnic items. The nearest airport of Jodhpur is Udaipur. The airport is well connected to Jodhpur by roadways. Trains are available from Delhi and Mumbai to Jodhpur. It is also well connected by the national highways and other small roadways.